Prime Minister Trudeau gave his definition of the national interest on Sunday, and it begins with a hotly disputed pipeline expansion that he’s determined to see built. Prime Minister Justin Trudeau gave his definition of the national interest on Sunday, and it begins with a hotly disputed pipeline expansion that he's determined to see built. 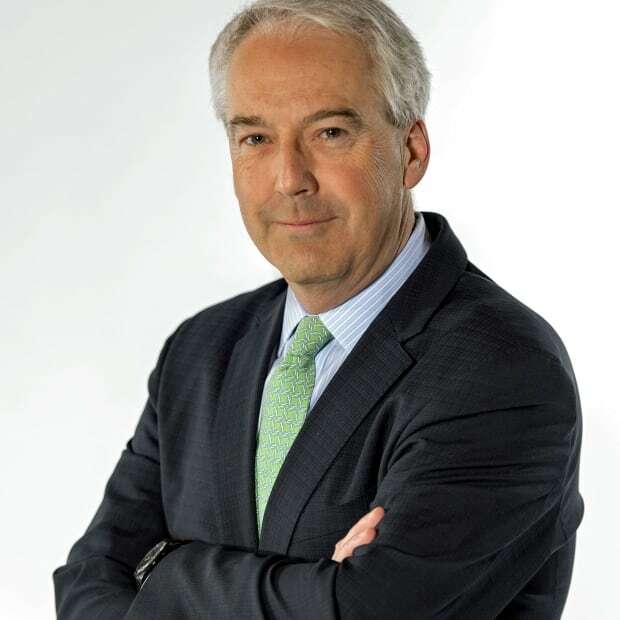 Kinder Morgan's proposed $7.4-billion project to triple the flow of Alberta bitumen through its Trans Mountain line is rapidly becoming a symbol of a new generation of constitutional discord and western alienation in this country. It also threatens to become a serious obstacle to the prime minister's efforts to repair relations with at least some of this country's Indigenous people. 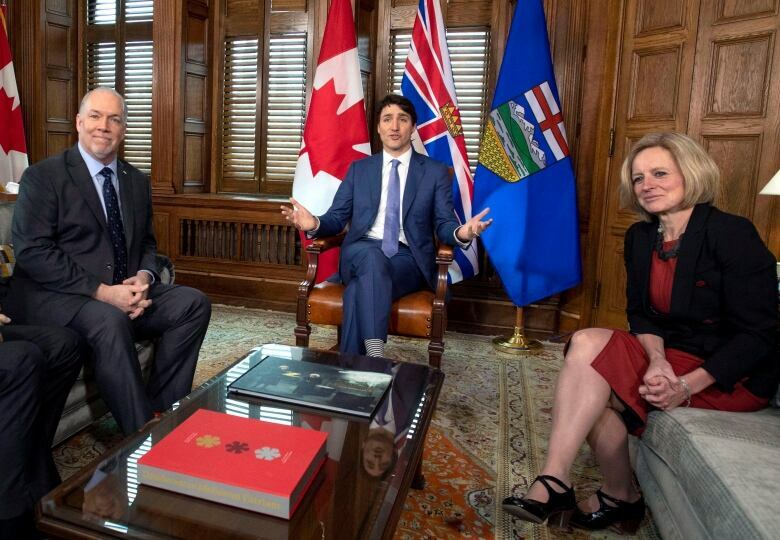 Yet there Trudeau was on Sunday, after a brief and apparently harmonious meeting with the feuding NDP premiers of British Columbia and Alberta, repeating his commitment to see the pipeline expansion through and, in the process, irretrievably committing himself and his government to that cause. The prime minister said negotiations will get underway soon that could see hundreds of millions of dollars in taxpayers' money committed to the outcome. He's promising legislation that would give Ottawa total control over the project, which runs from Alberta's oilsands to port in the Vancouver area — overriding anything British Columbia might introduce to, say, protect the province's coastline or limit the amount of bitumen that can flow through that pipeline inside its border. "This is something Canadians expect us to do and, quite frankly, international investors who look at creating jobs in Canada want to see us able to do," Trudeau told reporters, arguing this country can't afford to continue selling its energy at a steep discount to its primary customers in the U.S. But his determination doesn't end there. Trudeau's even willing to risk alienating Indigenous communities in B.C. 's Lower Mainland who insist his government failed in its duty to consult them, and to get their free and informed consent as set out in the UN Declaration of the Rights of Indigenous People. The obvious question is — why? Why is Justin Trudeau investing so much in a single pipeline? Why did his officials meet on Friday in Toronto with Kinder Morgan executives — who issued a threat to abandon the project while the prime minister was travelling to a vigil in Saskatchewan for those killed in that tragic bus accident, and who can still walk away from it on May 31 if they aren't satisfied? "We are one country with a federal government that is there to ensure the national interest is upheld," Trudeau told reporters after Sunday's meeting. At least part of the reason is that the government believes opponents of the project, while vocal, are outnumbered by those who support it. Another is that investors of all kinds are worried by the uncertain business climate this dispute is creating. "It is the right thing for Canada. For the economy. For hard-working Canadians who work in the industry," said Tim McMillan, CEO of the Canadian Association of Petroleum Producers. "Their voices are being heard and that hasn't happened in a long time." Trudeau also knows the government of NDP Premier Rachel Notley is prepared to act even more quickly. The province will table a bill on Monday that Notley said "would let Alberta deploy resources in a way that get the best return for Alberta." Translation: the province would give itself the right to charge world prices on any oil it ships to British Columbia. Still, that doesn't offer much in the way of cover for the political risk Trudeau is taking. Chief Bob Chamberlin is vice president of the Union of BC Indian Chiefs. He said he can't reconcile the Trudeau who promises reconciliation and partnership with First Nations with the leader he now describes as more worried about the welfare of a U.S.–based oil company. "It is completely unfathomable to me that a company that is not within Canada has dictated an ultimatum and a timeline for Canada to knowingly and willingly to run over the rights of First Nations people." He said there will be more protests against the pipeline. More court challenges in addition to the ones First Nations have already filed. Less trust in the Liberal government. As for B.C. Premier John Horgan, who campaigned against Trans Mountain — and whose minority government depends on the even more anti-pipeline Green Party to stay in power — spoke Sunday as if he'd wrung some commitments out of Trudeau to put even more resources into its $1.5-billion Ocean Protection Plan. "At the end of the day we agreed that there may well be an opportunity for us to have officials address some of the gaps we perceive in the plan," he said. "However, we remain committed to ensuring that we are protecting our jurisdiction in that regard … I and he will not be in power forever. And that's why the jurisdictional question is so critically important." 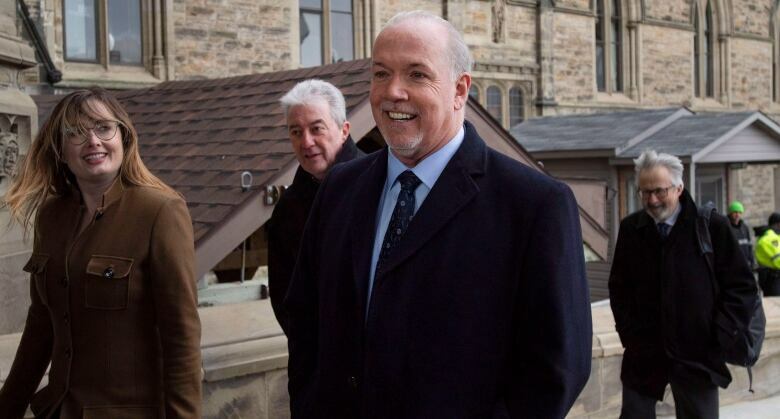 Horgan said his government still intends to proceed with its own court reference to determine what powers it has under the constitution to regulate the project. He's prepared to go to court again depending on what's in the legislation Alberta and Ottawa propose. Horgan's getting some advice on that list from the Quebec government, which has a long track record of opposing any encroachment by Ottawa into areas of provincial jurisdiction. 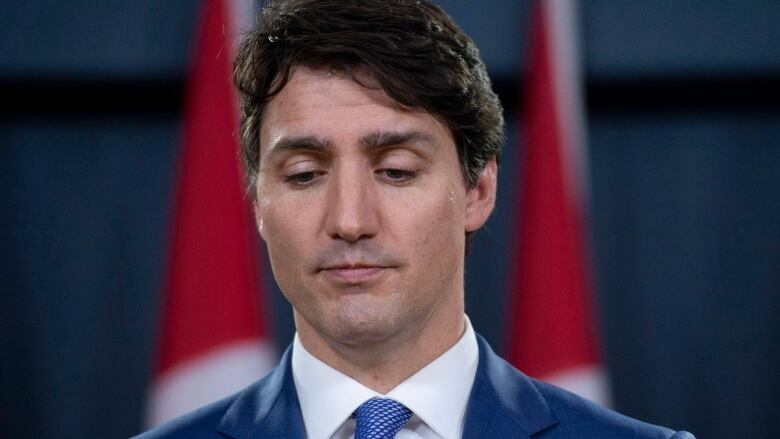 Add it all together and it becomes clear that Sunday's short meeting in Ottawa did nothing to avoid what is promising to be a long and costly political battle over Justin Trudeau's version of the national interest.